Be the first to share your favorite memory, photo or story of Cherl. This memorial page is dedicated for family, friends and future generations to celebrate the life of their loved one. 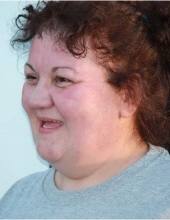 Miss Cherl Lynn Holbrook, age 48, of Olive Hill, passed away Tuesday morning, January 22, 2019, at her residence. She was born April 14, 1970, in Rowan County, Kentucky, a daughter of the late Josphine Holbrook. Cherl loved reading and spending time with her daughter, Sarah. She is survived by one daughter, Sarah Holbrook of Olive Hill, Kentucky. She also leaves many other family members and friends who will sadly miss her. A memorial service will be held at 7 p.m. Monday, January 28, 2019, at Globe Funeral Chapel in Olive Hill, Kentucky. Friends may visit from 6 p.m. to 7 p.m. Monday, January 28, 2019, at Globe Funeral Chapel, 17277 West Highway US 60, Olive Hill, Kentucky 41164. "Email Address" would like to share the life celebration of Cherl Lynn Holbrook. Click on the "link" to go to share a favorite memory or leave a condolence message for the family.